Mary Shelley's original novel, ""Frankenstein: Or the Modern Prometheus"" is not only a masterwork of horror, but it's also considered to be one of the earliest science fiction stories ever. Even today, its themes of man exerting god-like powers in order to create life from death remain a passionately debated topic as modern science continues its experiments with cloning, DNA, and stem cells. 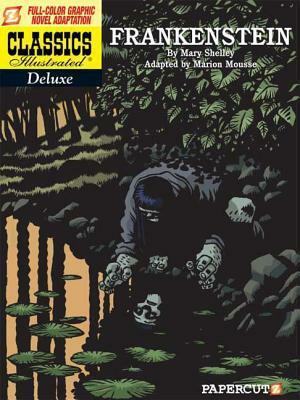 Marion Mousse brings the story of Dr. Victor Frankenstein and his tragic monster to frightening new life in this all-new comics adaptation, with dark and brooding artwork that appeals to today's fans of cutting-edge graphic novels. With the greater page length the CLASSICS ILLUSTRATED DELUXE provides, so much more of the original novel is part of the adaptation, which quite possibly makes this the best comics version yet. Marion Mousse (Adapter and Illustrator) is a French comics artist and writer whose distinct style can be seen in such works as "From Outer Space," "Fracasse," and "Moonfleet. Her gloomy and ominous work builds a distinct world for this new adaptation of Shelley's classic.